Doughnuts seem simple, but finding the perfect one can be difficult. It is March. You know what that means. 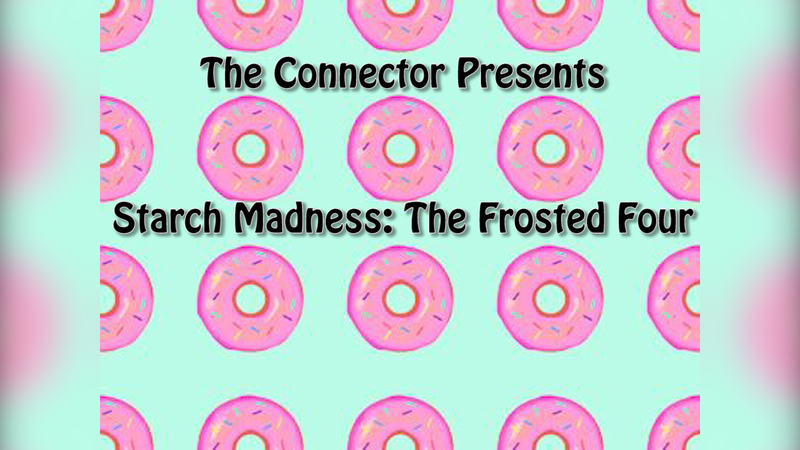 The Connector’s Starch Madness local doughnut bracket returned this month as a special for the Downtown Lowell Issue and a play on college basketball’s March Madness. This year, we shrunk the field to four doughnut shops in the area: No. 1 seed Donut Shack, No. 2 Top Donut in Lowell, No. 3 Heav’nly Donuts in Dracut and No. 4 Donna’s Donuts in Tewksbury. The one-four matchup pit the quaint, unique locations against each other, while the two-three contest saw shops with more than one location battle it out. Thus, the Frosted Four was born. It would not be the Frosted Four without each shop’s glazed doughnut represented, so that was the competing doughnut in our semifinal matchups. Aside from the name of the competition, we found the glazed to be a staple and, therefore, a fair basis of comparison in the first round. Heav’nly offered a light, sweet taste with their glazed, reminiscent of a cider doughnut. Their donut was smaller making for easier consumption, a plus for the Dracut location. On the other hand, Top Donut provided some bang for our buck with a much larger doughnut than its counterpart. The lighter consistency combined with the larger volume, however, made it more of a chore to take down. The hint of a peanut butter aftertaste was also off-putting, giving a 2-1 edge to Heav’nly Donuts in the semifinal round. Donut Shack entered the competition as the heavy favorite because of the addicting, sweet taste to their glazed doughnuts and our collective experience with them. This was proven true once again, but would it be enough to make the clock strike midnight on the Cinderella known as Donna’s Donuts? Donna’s glazed brought a concoction to the competition that ultimately gave it the edge in the sweetness of the dough itself. Where Donut Shack’s excellent glaze makes it a favorite, Donna’s brings the house down in not needing as much to create a stellar confection. Ultimately, it was another 2-1 decision in the semifinals, this time in favor of Donna’s Donuts. Switching things up for the championship, we pitted the two shops’ jelly doughnuts against each other for the final round. As much as the glazed is a staple in the doughnut community, jelly allowed us to explore a bit more complexity for the two shops to make it to the big stage. Heav’nly nearly achieved perfection with their jelly in terms of their powder, jelly and dough, which are all the necessary componets to pull of this doughnut successfully. The perfect combination resulted in a flawless taste, which, if not for slightly lacking in presentation, set the bar likely too high for Donna’s to catch up. When it was time for Donna’s to bring their A-game and seal the championship as the lowest seed in the bracket, their jelly just was not up to par with the standard set by Heav’nly. Donna’s jelly doughnut could not compare in the aforementioned qualities. While Donna’s brought quantity to the table with a larger doughnut, quality was all that mattered as Heav’nly brought the brooms out for a 3-0 victory and the first-ever Starch Madness Frosted Four title. Connector editors Alex Salucco, Brock Johnson and Taylor Carito contributed to this article.